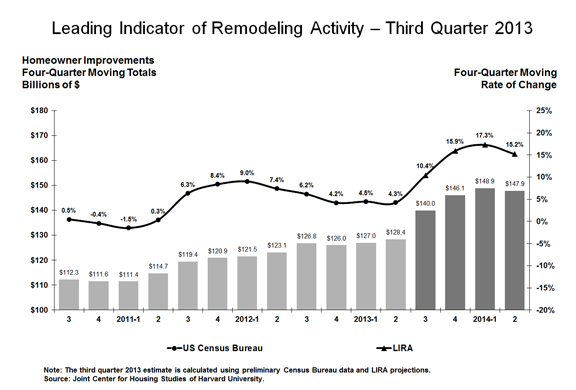 The home remodeling market continues to improve, with strong gains expected for the remainder of 2013 and the beginning of 2014, according to our latest Leading Indicator of Remodeling Activity (LIRA). While the LIRA continues to project annual improvement spending increasing at a double-digit pace in the near term, a slowdown of this growth can be expected by the middle of 2014. The soft patch that homebuilding has seen in recent months, coupled with rising financing costs, is expected to be reflected as slower growth in home improvement spending beginning around the middle of next year. However, even with this projected tapering, remodeling activity should remain at healthy levels.